Facial Expressions from Loomis´ "Fun with a pencil"
I had done this portrait drawing yesterday, from Loomis´ book and thought I would post this here, along with a few along-the-way photos. Hope this is useful for anyone learning to do the same. I have established the tone here by holding the pencil differently, as taught by Mr. Glenn Vilppu; its terribly useful, you have more freedom of movement and the strokes look much more freer and its easier to cover large areas quickly. It takes a while to get used to and I have resisted learning this way of holding the pencil for a long time (!!) because at first you don´t get the same kind of accuracy/control that you get while doing it your normal way (which is holding it in the same position that you do as while writing!) But I love it now. So, this is the way you do it: first make a long tapering point on the pencil with a pen-knife; you can´t do it as easily with the short point that comes when you sharpen with a pencil sharpener. Then hold the pencil so that it aligns almost horizontally with the plane of the paper so that you can drag the length of the point along the surface of the paper to create tone. Holding it at slightly different angles gives different widths for your tone. Here, in this first step, I am basically concerned with the tilt of the head and the proportions. Her head is tilted slightly towards the (our) left. Draw a vertical line for the length of the head (top of head to bottom of chin) tilted slightly towards the left. The eye line lies horizontally on the mid point of this line, naturally also tilted so that it is at right angles to the vertical line. Draw the eye brow line a little higher. The bottom of the nose lies on the mid line between the eye brow line and the bottom of the chin. The bottom of the lower lip lies on the mid line between the bottom of the nose to the bottom of the chin. The distance from the bottom of the nose to the pit of the neck is the same length as the length from the top of the head to the bottom of the nose. I think I finally ‘got’ it! After weeks and months of trying to understand and going through book after book after book and struggling and kicking myself, I now feel I can ‘do heads’. Yesterday evening, I was watching some of Glenn Vilppu videos on utube, and he was saying something about feeling the volume… (by the way, he teaches beautifully) that suddenly struck a chord within me and I thought let me just do it, how hard can it be…to put two eyes, a nose, a mouth and the back of a skull together to form a head (! ), so I plunked myself onto the sofa in front of the TV and Voila! they just flowed out beautifully and spontaneously, everything I have learned all these days coming together finally. So now I can proudly say that I too belong to that class of people on this earth who can do heads! I think its good to learn from a few, or maybe a lot of (good) books, rather than just stop at one or two because, it always happens that when you can´t just get it looking at the thing from one point of view, you suddenly understand, when you look at it from another person´s point of view. (or even the same persons´at a different point of time). Its most important to understand the structure of the head first, the way it is constructed and the way the different bones fit into one other, its planes and the way the underlying muscles move the flesh, when learning to draw it. 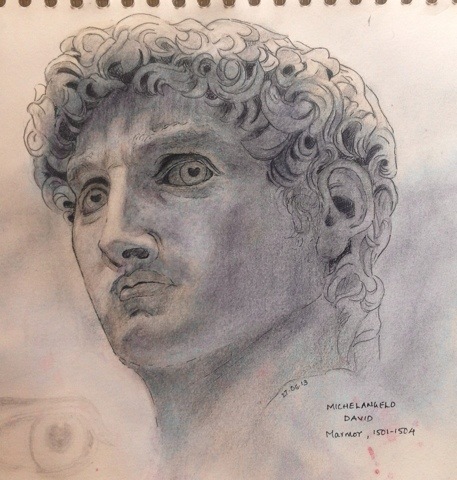 Its not so important to get the likeness of a person at first, but rather to feel the whole head along with its volume while drawing it, so as to make a well-constructed head; …..one in which the eyes sit in their sockets firmly; the nose is on the right plane perpendicular to the face; the ears go round the face on line with the brows and tip of the nose; the features move along with the tilt of the head; then the planes – the forehead comes out, the plane of the eyes goes inward, the plane of the cheeks comes outward, the mouth on almost a straight plane (though rounded from side to side), a small area beneath the mouth recedes inward and the chin protrudes outward. Its more important to get these foundations right rather than to get the features or get the likeness of the person, because there really is not that much variation in those heads. Once you understand the planes, its becomes really easy, not to mention fun, to do the ‘shading’ or toning or even painting. If you understand well which areas recede and which protrude, then you start toning down the areas which do not receive the light (for e.g, the plane of the eyes, (when the light comes from the top) for which reason the white of the eye is never really white, it has to nearly always be toned down). I toned down the circular braids on the right side, there was too much local contrast pulling the eye towards the area…added some shadows underneath to make them look more rounded …..and ..well..difficult to know where to stop.. especially if you like how its turned out; the more you like it, the more you tend to fiddle with it! I have painstakingly copied each line and curve of Da Vinci´s drawing ‘Study of Leda’ in the hopes that his talent would somehow rub off on me…..kidding…just kidding….then again, maybe not…! Looking at it on screen makes me realize I still have some more work to do on it, the tones have to be adjusted somewhat, will post again tomorrow.. I did this using the two cross hairs (two lines – vertical and horizontal) as described in Betty Edward´s book. Its really helpful. Here are the the photos of the stages in between. There is so much to learn from these old works… he has toned the drawing so beautifully, heavier, darker lines change into lighter lines seamlessly, in a continuous flow, and then back again into darker ones (for e.g., on the neck area) The small curves in the braids, as they go towards the back change in width and shape (even value), because the perspective changes, if they are made all the same, they will look flat and refuse to plunge backward. These are some studies I have done from ‘Drawing the face and hands – Andrew Loomis’. 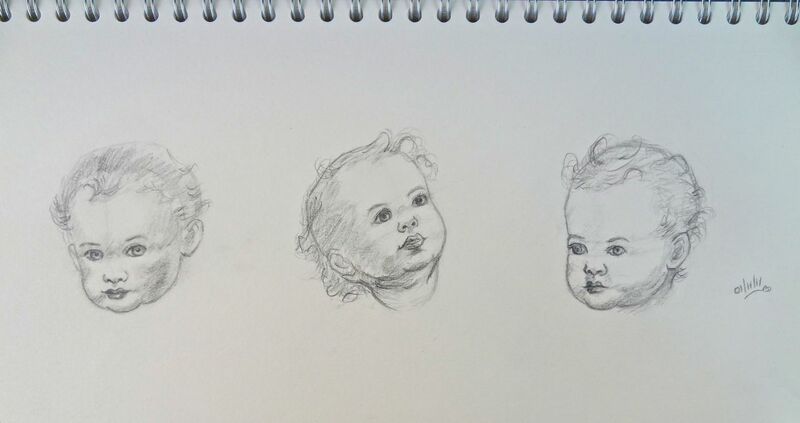 The key to drawing baby faces is not in their chubby and cute features, (though of course that also comes into play), but rather it lies in the placement of the eye brow line. The brows lie on the middle line of the head of a baby whereas on the head of an adult, the eyes lie on the middle line of the head. Knowing this fact also makes it easy to work out the faces of all the ages in between these two extremes. The blending stumps that you can see in the photo are rolled up pieces of acid-free paper. They are very useful for evening out tone in small areas like on the eye and lip region. For larger areas, a tissue paper wrapped around the forefinger works well.